Around Christmas I discovered Netflix had delivered a gift that I had been wanting for some time now. Not free movies or an even better selection, but the gift of privacy. I have a reputation in my family for awful taste in movies. I prefer to attribute it less to taste and more to an unfortunate combination of a tireless movie appetite and high pain threshold. My low point was probably during law school exams when I procrastinated by watching Leprechaun 3 with my roommate. Also, considering most households share a single Netflix account, shouldn't there be a way to hide your shame and delete your viewing history? And really, I did just "accidentally" click on The Princess Diaries. I mean, why would I watch that - really? Leprechaun 3 and The Princess Diaries illustrate privacy issues within the walled garden of the company you decided to trust with your information. The stakes get higher when your information is shared with (or leaked to) others. This can be true despite good intentions and anonymization of your information. The proliferation of publicly available databases about you, coupled with the incredible processing power of today's computers, have raised the bar for keeping information truly anonymous. I'm not a data scientist, but you don't need to look far to find articles about why anonymization isn't an iron-clad approach to protecting a person's privacy. Now you may be asking, "What's the big deal? I've got nothing to hide. What's the harm?" If you like science fiction or pizza, click on the video below for one reason. If you don't like science fiction or pizza, but still want to unwrap your privacy gift from Netflix, skip the video and scroll down. I think like security, privacy will become more of an imperative to companies going forward. And the best implementations will give you options on how to control your personal information. So kudos to Netflix for giving its users more control. If you want to manage your viewing history, just follow the EZPZ steps below. Step 1: Go to account settings and click on "Viewing activity"
Note: You can remove all episodes of a show by clicking on "Remove series?" Step 3: Enjoy your video binging with enhanced privacy! Thanks, Netflix for giving your users more control over their privacy. Good stuff. One of my more questionable characteristics, which I totally own up to, is my stamina for watching copious amounts of television and movies. I never met a good or bad movie I wouldn't watch. Probably my low point came when during law school final exams, my roommate and I watched all of Leprechaun 3, which is a really, really, really bad movie. So when DVR was introduced it was love at first sight. And streaming services like Netflix and HBO Now are right up my alley. One downside to these streaming services and DVR is that you get so used to not having commercials or being able to Fast Forward (or as Adrian Monk says, "picture go fast") through them that you have a lot less patience with commercials. I recently binge-watched the first season of Mr. Robot on the USA app. It wasn't available anywhere else and each episode has several commercials throughout. It's free so I can't complain too much about the presence of the commercials, but it seems like they rotate the same two or three commercials all the time and you can't skip them. My first solution was to simply look away while the commercial plays. This wasn't great because now I felt like I was getting subliminal audio messages. Then I decided to also unplug my headphones. The problem with this approach is that sometimes I lost track of how much time had passed and it would be a pain to backtrack to the right point right after the commercial. Surely there is a better method. What I ended up discovering is that Apple devices have unintentionally provided the perfect EZPZ commercial neutralizer. 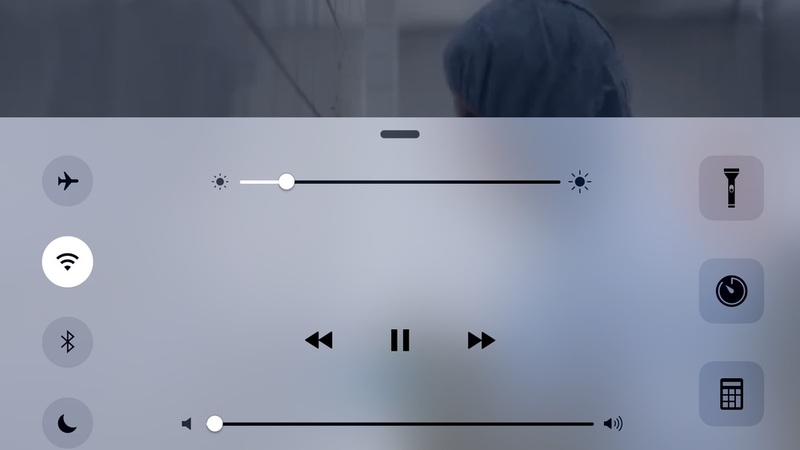 So now when the commercial starts, you can just mute the volume and swipe up from the bottom of the iPhone to activate Control Center. What you end up seeing during the commercial is a bunch of silhouettes in the background. For example, this is a frequently advertised men's product. This is one for a U.S. cell phone. Can you tell which one by the color at the bottom? You can usually tell when the show is starting again so at that point, you just swipe down, turn up the volume, and voila, a more EZPZ way to skip through commercials! Now what if you have terrible timing? Or can't stand the uncertainty? This is where the peekaboo comes in. If you pull down slowly, just a bit, you'll see the edge of the screen, which will give you a better indication of whether the show has started or not. There's nothing wrong with watching the commercials and their existence supports the content. But as for me, I can't stand being subjected to the same lame and sometimes, targeted commercials over and over again. Great for the marketers, not so much for me. So next time you want to avoid seeing something on your screen, try the peekabo technique. Having access to movies or TV programs when you are traveling is great for families, especially those with children. Having a travel friendly laptop, tablet or a larger phone is great for individual viewing, but doesn't cut it when it comes to enjoying a program together. Plenty of hotels provide a selection of free and paid entertainment through the TV in your room, but there are times when this doesn't cut it. On your next vacation, expand what you can watch on the hotel TV by using your Chromecast (Roku or Amazon Fire TV stick). Before you leave, set up your Chromecast to work on the WiFi network that your wireless travel router uses. 3. Cast and enjoy Netflix, YouTube, etc! Note: You might need to manually change the input on your TV. If you need help with this, check out the super secret way to do this with some of the more common TV's. Finally, an alternative that requires less tech savvy is to bring your own portable DVD player and hook it up to the hotel TV.